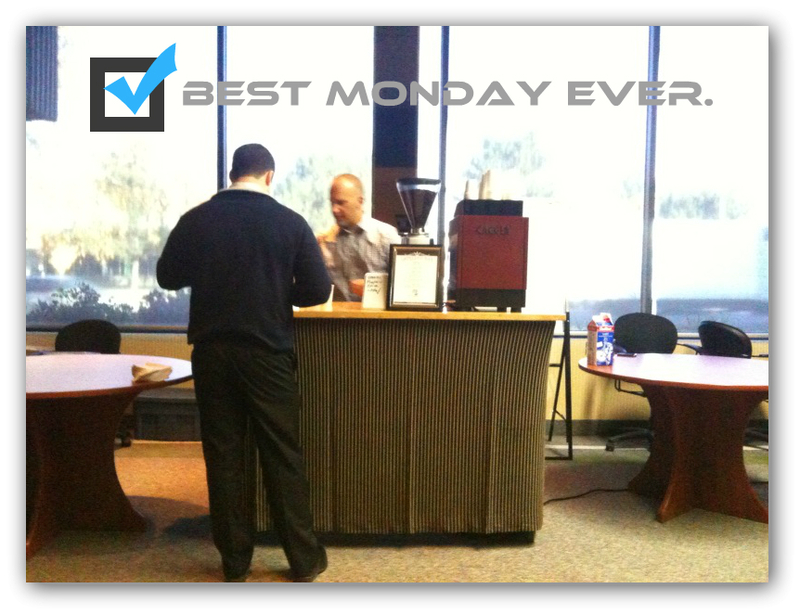 Today, my CEO Steven Stein treated the whole office to coffee. No, I’m not talking about a Timmies run. I’m talking about a bringing in a travelling barista to brew and mix gourmet coffees and teas. Talk about the ultimate beat down of the Monday Blues! Michael Scott from Espresso Uno (@GTAEspressoUno) was our personal barista for 3 hours. My co-workers and I had our pick of different specialty coffees including cappuccino, latte, mochaccino, hot chocolate, mocha, and pumpkin spice latte! I tried the cappucino (flavourful and rich) and pumpkin spice latte with a dash of cinnamon (I can’t get enough of pumpkin). 1) What is the most popular drink that people order? Latte. 2) Fill in the blank: I can’t leave home for work without: ______? Ghirardelli Chocolate Syrup for the Famous Mochaccino. Thank you, Steven for bringing Espresso Uno to the office! Talk about a swell guy!